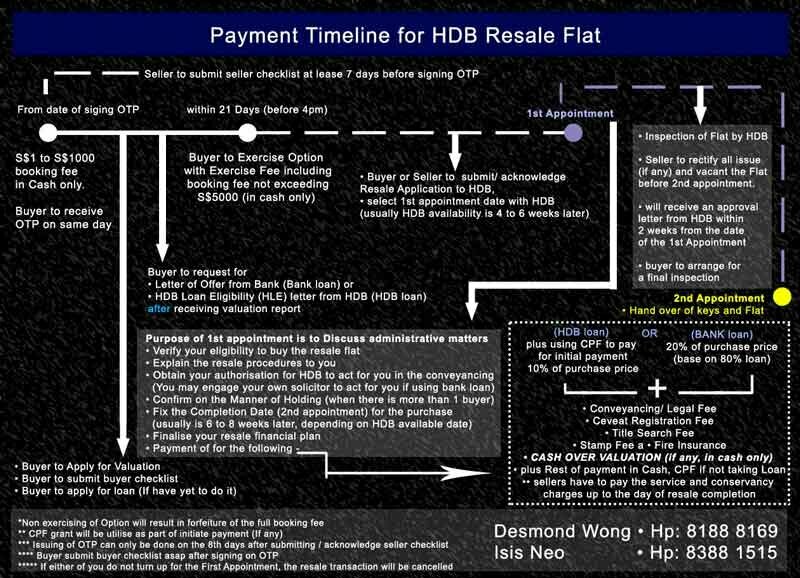 In Singapore, purchasing a resale or a property under construction or an Executive condo have different payment scheme. There are progressive payment, Deferred payment and direct payment. Deferred payment is only applicable for New Executive Condo. For new property purchase directly from the developer or homeowner, as long as the unit is completed, it will be Direct payment. Assuming you qualified for the max 80% loan, you will need to pay 20% downpayment which will have the different break down for the different property type. Your payment schedule will depend on the progress of the construction stages. This also applies to the buyer of Executive Condo not opting for deferred payment and buyer of the private condo under construction. *Note- Stamp fee, Lawyer fee etc is not included in the illustration. ***Max loan amount is 75% of the purchase price. * Note: The balance amount after initial payment will be payable in Cash, CPF and/or Instalment. The cash payment is computed based on purchase price or the current market valuation of the flat, whichever is the lower. Existing property owners are considered as having no outstanding residential property loans as they must dispose of their existing property within 6 months from their next HDB flat or EC purchase. For more details, please refer to MAS’s press release on 5 July 2018. The Temporary Loan Scheme (TLS) helps flat buyers who intend to use the sale proceeds from their existing flat to pay for their new flat, without taking a mortgage loan. You can apply for a temporary loan to complete the new flat purchase first, while the sale of your existing flat is underway. You will then redeem the temporary loan using the net proceeds from the sale of your existing flat. Once the temporary loan is approved, you will be invited to collect the keys to the new flat after your resale first appointment. The temporary loan will be offered at the prevailing non-concessionary interest rate. If the temporary loan amount (capped at the net sale proceeds) is not enough to complete the new flat purchase, you must top-up the shortfall in cash within the stipulated time period so that you can collect the keys to the new flat. Please submit the Request Form for Temporary Loan form together with the resale application for your existing flat through MyDoc@HDB.